Letter sent by email to 8 Prime Ministers and Presidents connected with the ownership of LIAT: There was a single (one) acknowledgement, and the one sent to the Barbados Prime Minister’s Office bounced because the mailbox was full. In 2010 it was reported that Saint Maarten government-owned Windward Islands Airways NV lost some US$1.5 million, and the airline was cutting routes to stay afloat. In March 2011 the Board resigned en masse, protesting ongoing political interference. In October 2011, a new Board was appointed, naming businessman and aviation veteran Michael Cleaver as CEO. Cleaver started his tenure as part of the restructuring of the (then) fifty-year-old airline, the new management structure including former Managing Director Edwin Hodge, and the next year WinAir started expanding. With the new Board’s appointment came independence from politics and government, and in 2012 WinAir started on a program of strategic alliances and expansion that continues to the present day. In 2015 WinAir, with the Sint Maarten government, refinanced the airline’s debt, and in February 2016 WinAir had paid off its entire debt to the Princess Juliana International Airport. 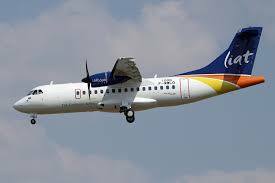 On Saturday, 16 July 2016, two news articles report the announcement from the WinAir Board Meeting on Wednesday 13 July that in 2015 the airline made an operating profit of almost US$3 million – all this by an airline that owns no aircraft, and operates just four leased 19-seat Twin Otters. Now a change of focus from the Leewards to the Windwards. Prior to 2013, LIAT was carrying some 1.6 million passengers a year. Today, LIAT is carrying half (or less) that number, while employing the same number of staff and flying even more aircraft than before. In other words, half the revenue at the same (or higher) expenditure (and servicing a massive debt). The “fuel savings” touted for the ATRs have clearly not materialised, nor has the reliability factor promised to the Board of Directors. Pilots are now leaving LIAT at unprecedented rates, in clear expectation of its demise, where in the past LIAT was viewed as the premium desirable airline employer in the eastern Caribbean. It will not be long before LIAT is suffering from a pilot shortage — indeed, that may already be the case — while its pilots seek more reliable and less incompetent employment elsewhere. The shareholder Chairman of LIAT, PM Gonsalves, continues to insist that LIAT be run at a loss to its shareholder taxpayers — in an environment where his share of the losses is a mere 13%, while Barbados and Antigua between them have to shoulder about 80% of that loss burden. Further, PM Gonsalves has severely abused his position of authority over LIAT by demanding that one of the new aircraft land — as a purely political stunt — at the unfinished, unopened, uncertified and uninsured new airport of Argyle while it had a huge gap in the surface two-thirds of the way down the new unfinished runway where the massive flood drains were still being installed across and under it. LIAT, I understand, now loses some US$50 million a year. Since LIAT — a corporation owned by the taxpayers of several countries — has never published any annual accounts in public, nor are they ever discussed in the Parliaments of any of the shareholders, the losses could easily exceed that amount and (except for the Prime Ministers) no shareholder country taxpayer would know the difference. Gentlemen, I am not sending this to PM Gonsalves because I have made several attempts through him (as the proper channel to do so) to influence the way LIAT is run (for the better), and even going as far as to find approval for a US$200 million loan and to offer a Joint Venture. His response has always been to attack the messenger instead of to listen. On that Joint Venture offer occasion I met dead silence for three months, and was then called a Buccaneer in the subsequent news conference when he was specifically asked about it. PM Gonsalves clearly believes with all of his heart and soul that LIAT is his personal airline. So, as far as I am concerned therefore, PM Gonsalves and I no longer have anything to discuss, and so I don’t plan to waste his time or mine. Instead, I write to you — who control 80% or more of the airline — and hope that you may find some reason in my words, knowledge and intimate experience with Caribbean aviation. Government-owned WinAir was handed to the private sector and told to “sink or swim”. Installed competent management have not only kept their heads above water but have taken to the skies with the future end of Profit and Loss graph ribbon. I suggest to you that LIAT can do the same, but timely decisions are required. With apparently bottomless taxpayer pockets none of you have seen fit to address this problem, and I ask that you do so, forthwith, immediately, while the search for a new CEO is being carried on. The overall suggestion is to do as WinAir; to remove the politics and all of the political appointees and allow the private sector — those who are experts in their fields — to take LIAT back to the wonderful, reliable, happy inter-island feeder service we used to have two or three decades ago. Remove the politics from LIAT — start by changing the shareholder Chairman to someone who may actually be interested in innovating to change the airline, such as PM Roosevelt Skerrit of Dominica. Replace every member of the Board with regional citizens who have more than a clue about airlines and aviation (preferably with appropriate airline qualifications and experience). Brian Meade, originally of Montserrat, lived in Antigua & Sint Maarten, now lives in Dominica. Brian Challenger, past LIAT Board member and past CEO of LIAT. Publish schedules and provide a reliable, on time service systemwide. Have the new Board (NOT politicians or purely political appointees) examine the current executives of LIAT and, if they are lacking, have them terminated. Have the Board then advertise for and hire a professional team of executives and managers to reorganise LIAT — where preference is for regionals, but ex-patriates would be hired where necessary with contracts for five years the requirement that they train a qualified regional to replace them. No political appointees at any level, no Permanent Secretaries, no City business owners, no Party friends, no “political flies on the wall”, no “Commissars” to direct management’s path. All who are appointed to the Board should be REQUIRED to have some real, actual aviation and/or airline experience and qualifications, even if they do not currently work in aviation any more or are retired. Board, executives and management should not have tenure. If this is to be run as a business then if they cannot perform to satisfy the shareholders’ broad mandates and keep to management’s five-year plan they should be replaced with individuals who are willing and capable of doing to. To allow otherwise is to slip back into incompetence and losses. In the private sector, allowing any Board or management to lose massive amounts year after year and still continue with “business as usual” is called suicide and, if there are investors, that management is subject to prosecution. Finally, you just returned from a Heads Of Government Meeting in Guyana, but according to the reports coming out of the meeting not once did you seriously discuss the question of reducing or eliminating the “cash cow” taxes and fees which are have been crippling aviation and travel in the eastern Caribbean for at least a couple of decades – and are actually becoming more onerous by still being increased. You cannot expect progress if you keep sabotaging the process – you will increase revenue from service charges by making it more affordable and increasing the number of users, not by crippling the service with staggering fees nobody can afford. You were all keen to criticise the British APD for your own narrow reasons, yet you are effectively doing the same right here at home — some will say you are doing even worse. In my neck of the woods that is called hypocrisy. It does not take a brain surgeon to recognise that if you reduce or eliminate these taxes and fees LIAT will most probably bounce back (if there is competent management) and what you lose by reducing/removing those taxes and fees will be more than made up by the volume of passengers. Many of the islands can tell you to the penny what each visitor spends… if there were twice as many visitors, simple math suggests to me that you will probably promote twice as much spending in your economies, and therefore twice the taxation from those sources. I seriously hope you will read this to the end and consider my suggestions and comments for immediate action — or at least for immediate discussion with your HoG peers and Ministers.